Padmanabhan A et al. Non-junctional E-cadherin clusters regulate the actomyosin cortex in the C. elegans zygote. 2017. Current Biology. 27(1). 103-112. doi: 10.1016/j.cub.2016.10.032. Figure: The schematic depicts the role of non-junctional HMR-1 clusters in resisting cortical flow and stabilizing the cortex during cellular processes such as cytokinesis. In wild-type cells, HMR-1 clusters prohibit myosin-II localization at the cortex and limit actomyosin contractility-mediated cortical flow, thereby impeding furrow ingression during cytokinesis. However, in HMR-1 depleted cells, increased actomyosin contractility- mediated by the accumulation of myosin-II at the cortex- destabilizes the cortex and promotes rapid cortical flow. 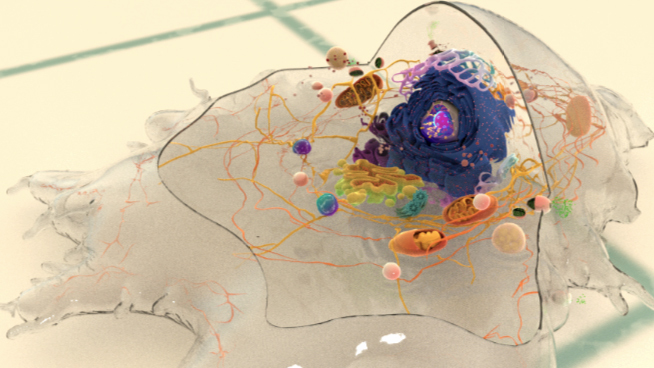 This speeds up furrow ingression and other cellular processes dependent on cortical movement. The study describes a novel role for E-cadherins in slowing down cortical flow and stabilizing the cortex, and at the same time, regulating cell shape dynamics during fundamental cellular processes such as cytokinesis. Using C. elegans embryos to study the role of non-junctional cadherin clusters, the researchers show how HMR-1 (the sole cadherin in C. elegans) aggregate into dense clusters that localize at the cell surface. The intracellular domains of HMR-1 in clusters associate with actin filaments via beta-catenins and anchor the cortical actin to the cell surface, thereby slowing down cortical flow and preventing cortical deformations. While the cortical localization of non-muscle myosin-2 (NMY-2) and actomyosin contractility is significantly downregulated in the presence of HMR-1 clusters, HMR-1 impedes cortical flow even in a NMY-2-independent manner. 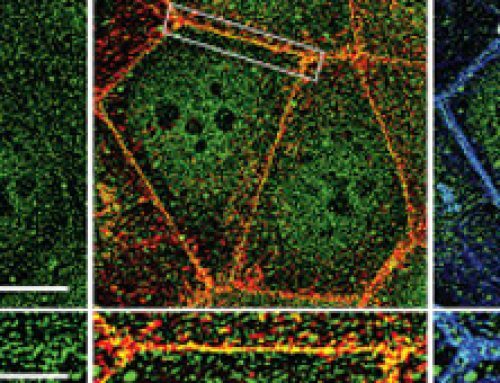 How is the actin cytoskeleton linked to adherens junctions? The cadherin protein family are common cell-adhesion molecules (CAMs) that mediate cell-cell contacts at anchoring junctions (e.g. adherens junctions, desmosomes) and at prominent sites of cell-cell communication (e.g. neuronal synapses). There are over 100 different cadherin family members that are grouped into at least 6 subfamilies, including type I classical cadherins, type II atypical cadherins and desmosomal cadherins. All cadherins share a common architecture in their extracellular domain that comprises cadherin repeats, with classical cadherins containing five of these repeats. Subtle differences between cadherins impart each type with specificity for particular tissue and cell types. Cadherins use a common set of adaptor molecules and pathways to facilitate cell adhesion and communication, however the strength of adhesion varies with the type of cadherin present. The structural link between the actin cytoskeleton and cadherins in adherens junctions is comprised of direct interactions in the following order: cadherin tails bind beta-catenin, beta-catenin binds the VH1 domain of alpha-catenin, and the VH3 domain of alpha-catenin binds actin. Although alpha-catenin is known to be essential in this link, recent biochemical and in vitro studies by the Weis and Nelson group has shown that a direct link between the cytoskeleton and alpha-catenin is unlikely to occur in vivo, and instead, is likely mediated by additional adaptor proteins. Actomyosin refers to the actin-myosin complex that forms within the cytoskeleton. Actomyosin is inherently contractile, with the myosin motor protein able to pull on actin filaments. This property gives rise to contractile fibers that form the basis of skeletal muscle, and even in non-muscle cells, enable cell motility and force generation at the sub-cellular level. Actin filament networks, both within filopodia and lamellipodia, are highly dynamic structures. A number of cellular processes such as filopodial retraction and lamellipodial/lamellal contractions, rely on the rearward movement of the whole filament network or large filament bundles. The retrograde motion of actin treadmilling may play a minor role in aiding these processes. One class of proteins that has been implicated in the translocation of F-actin is the myosin motor protein family. 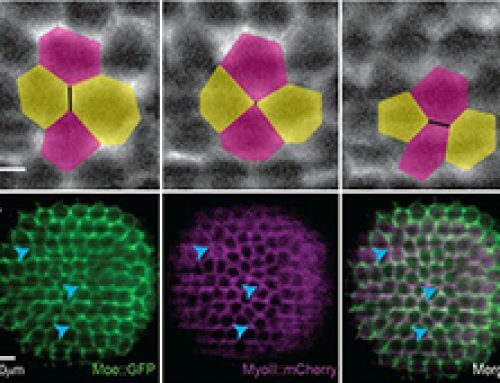 Each member of the myosin family possesses unique structural and functional properties, such as their step size, that determines their ability to engage in F-actin translocation. Myosin II specifically, has been associated with F-actin retraction in several cell types including neurons, fibroblasts and keratocytes. During polarization of C. elegans zygotes, HMR-1 aggregated into dense clusters that localized at the cell surface. Upon the initiation of cytokinesis, HMR-1 clusters displayed rotational movement that was found to be dependent on actomyosin contractility. 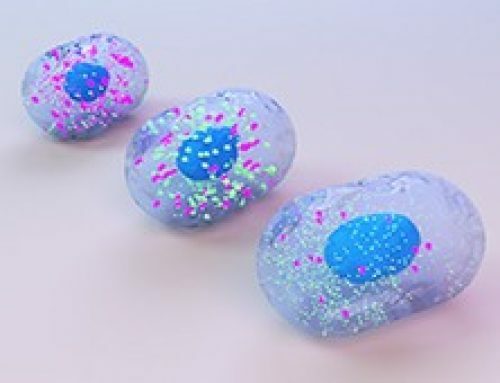 Following cell division, although a population of HMR-1 proteins moved to the newly forming cell-cell junctions, non-junctional HMR-1 clusters were still observed in two- and four-cell stages. Non-junctional HMR-1 clusters associated with F-actin in the cortex and this association increased during cortical flow, such as during polarization and initiation of cytokinesis. 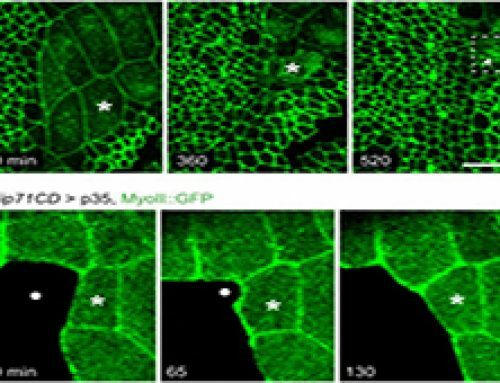 Non-junctional HMR-1 clusters negatively regulated the localization of non-muscle myosin-2 (NMY-2) at the cortex. This was evidenced by a significant increase in cortical NMY-2 levels when HMR-1 were depleted using RNAi. Non-junctional HMR-1 clusters regulated cortical NMY-2 levels by controlling RHO-1 GTPase activity in the cortex. HMR-1-induced decrease in Rho-1 GTPase activity led to a decrease in the recruitment of formins to the cortex, and as a result a decrease in actin filament synthesis and their association with NMY-2. Non-junctional HMR-1 clusters significantly slowed down furrow ingression during cell divisions in early C. elegans embryos. In HMR-1-depleted embryos, furrow ingression occurred almost 13% faster than in wild-type embryos. elegans embryos expressing just the intracellular cytoplasmic domain of HMR-1 (HMR-1 ICD) took significantly longer times for furrow ingression during cell division, suggesting a role for this domain in regulating actomyosin contractility. Removing the catenin-binding region on the HMR-1 intracellular domain did not affect cytokinesis speeds, indicating that HMR-1 negatively regulates actomyosin contractility by binding through catenin. HMP-2, the C. elegans ortholog of beta-catenin was found to mediate this HMR1-actomyosin association, since depleting HMP-2 led to faster cytokinesis. Non-junctional HMR-1 clusters was found to also found to influence furrow ingression speeds in an NMY-2-independent manner, when NMY-2 contractility was reduced by depleting its activator, Let-502. 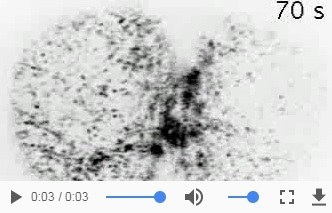 Non-junctional HMR-1 clusters impeded cortical actin flow, as shown by faster actin flow in the anterior region of the embryo that lacked HMR-1 clusters. 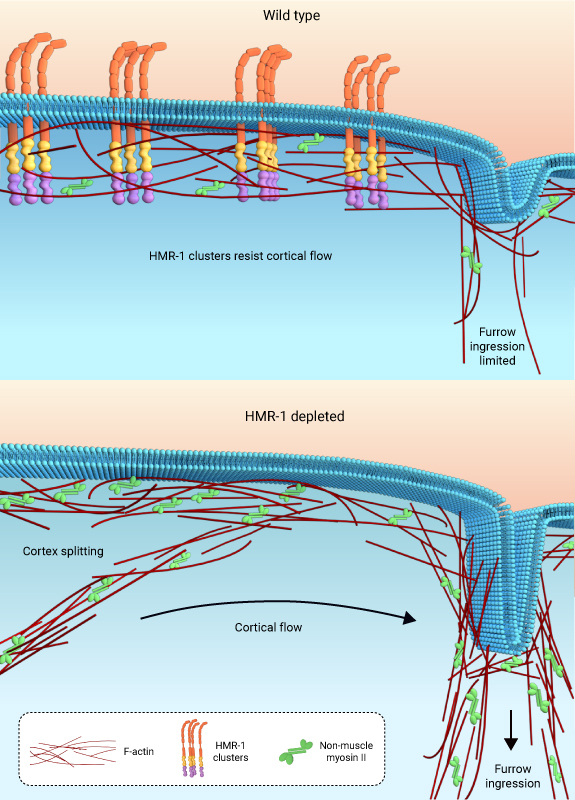 Depleting HMR-1 also caused faster actin flows during cytokinesis. In the absence of non-junctional HMR-1 clusters, a region of the cortex detached during the initiation of furrow ingression, suggesting that HMR-1 clusters plays a role in protecting the cortex from structural deformations. 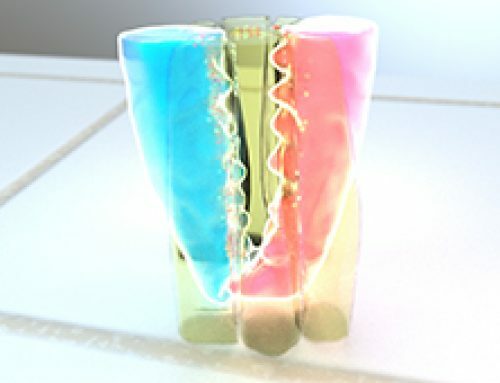 Proteins targeted for study were labeled with fluorescent dyes. Spinning disk confocal microscopy was used for live imaging of C. elegans embryos. Particle Image Velocimetry was used to analyze cortical F-actin flow and HMR-1 dynamics in the anterior region of the C. elegans embryos. By describing how non-junctional HMR-1 clusters protect the cortex from structural deformations and influence cortical dynamics during fundamental cellular functions like cell division, this study identifies a new role for cadherin, in addition to their well characterized role in mediating cell-cell junctions. By providing a better understanding of the in vivo functions of cadherin, the study creates possibilities for newer areas of investigations regarding cadherin’s role in health and disease.